The Hammerstein Theater was host to a full house of What We Do in the Shadows fans, all excited to hear about the new FX series based on the film. But the real thing the crowd was waiting for was footage, and they were not disappointed. 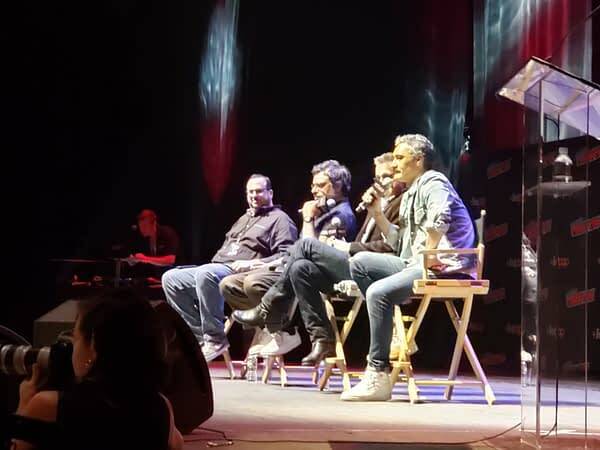 The press was not allowed to recount any of the specific content or offer a comprehensive review, and instead instructed to report on general impressions only (video recording of the panel itself – which included creators Taika Waititi and Jemaine Clement joined by FX producers – was explicitly allowed). The trademark humor and style – sort of The Office-meets-Interview With A Vampire-meets-The Young Ones– was very much intact, and was still hilarious. Whether it can be maintained over a full season or more remains to be seen, but it did feel as though it could go on all day and still be entertaining. There is still much comic material to mine here, and the pilot was very difficult to find fault with. Fans are right to be excited as they will not be disappointed. While any specific recount of the details of the trailer was prohibited, below is a portion of the panel Q&A where the setting was briefly discussed. What We Do In The Shadows is expected to premiere sometime in the spring of 2019 on FX. FX 'What We Do in The Shadows' Trailer and Release Date! 2 Teasers for FX's 'What We Do In The Shadows' TV Series! The Flash 5.1 “Nora” Recap: Nora is Here! Is That a Good Thing?